Arrived Wellington 4 August 1876. Researchers tracking early family names tend to fall between two extremes: those hunting for names like John Smith, with tens of thousands of possibilities, and those looking for complicated names that have been incorrectly transcribed, as happened to so many of the Poles arriving in New Zealand in the 1870s. Researchers of the latter, like me, seek confirmation. I was thrilled to discover Petone Settlers Data (through the Hutt City website). It provides lists of ships that landed in Wellington in the Vogel era. Some of the spellings were inventive—Rrebs?—but I was usually able to link a family to a name. Until the ship, the fritz reuter. Petone had no data on the ship, apparently because it was not an immigrant ship. It sailed into Wellington harbour (then still known as Port Nicholson) on 4 August 1876. Wellington in winter is not a friendly place, weather-wise, but the people on that ship could not have known the human chill that accompanied the Cook Straight winds. This story follows the reasoning why the fritz reuter is still apparently not considered an immigrant vessel. As the fritz reuter negotiated the seas between Hamburg and Wellington in 1876, its Polish passengers had no idea they were as unwanted in New Zealand as they had been in Prussian-occupied Poland. More than 260 Poles made up half the 515 “souls” aboard, the largest number of Poles who had arrived in the colony at any one time. Scandinavians, Germans and Italians made up the balance. Immigration officials would typically have counted the fritz reuter passengers as 422 “statute adults” but immigration officials did not count them this time. These “foreigners” had arrived apparently against the express order of the colonial government, a government that had bluntly stopped “foreign” immigration. It missed the fact that all settlers in New Zealand were foreign immigrants. The first large groups of British settlers arrived only 30 years earlier and would definitely have seemed foreign to the local Maori. Having deferred the Maori “problem” through war and land confiscation, the British colonists settled down to create pockets of “Little England” or “Little Scotland” throughout both islands. They did not appreciate the arrival of people who looked British but did not speak English. The evening post may have missed another reason for the New Zealand government’s discontinuation of these particular immigrants: being “foreign” was not as much the problem as was their getting free passage. In the 1870s, Prussian-occupied Poland was being absorbed into the greater German Empire whose government had legislated that its emigrants were not to sign promissory notes to other governments. The fritz reuter arrival coincided with public questioning of Sir Julius Vogel’s ambitious scheme to borrow millions to fund colonial infrastructure through immigration. Six years earlier Vogel had decided he could stimulate the colony’s stagnant economy and shattered reputation after the Maori Wars. He was an enthusiastic Colonial Treasurer in a new government after the 1869 elections and planned many construction projects, running in tandem, along the length and breadth of the country. His aspirations for the colony seemed to supersede a need to discuss the possible consequences of tackling such large projects so far away from labour and plant. Vogel’s 1870 Immigration and Public Works Act, with its offer of assisted immigration, did entice thousands. Many of the new arrivals did build roads, bridges and railway and telecommunication lines but in 1874, only two years after the first immigrants arrived under the scheme, the sheer expanse and scope of the work became the cause of its unravelling. In February 1872, Featherston employed immigration agents Messrs Louis Knorr and Co. to bring in 2,000 statute adults8 through Hamburg. However, by July 1872, after having “procured and conveyed” 500 people, Knorr refused to continue the contract on the grounds of the German government’s objection to the extraction of these promissory notes. The German decree forbidding promissory notes, and Featherston’s waiving of them and others, led to a fraction of the promissory notes repaid and arguments as to why some immigrants had to personally fund their passages and others not. 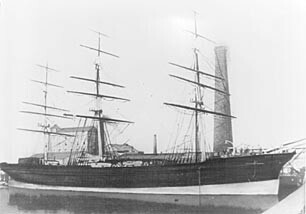 The palmerston followed in July 1872, arriving in Port Chalmers that December, also carrying around 100 Poles. Most of these Polish men worked on building the railway through the Taieri plain south of Dunedin. By the time the construction work had ended, many had bought their first properties. They built lives in Dunedin and established communities around Allanton and Waihola. At least five more ships from Hamburg carried Poles as part of Vogel’s immigration scheme, the reichstag, the humboldt, the lammershagen, the shakespeare and the terpsichore but only the latter three had more than a handful of Polish families. By then the cost and perceived mismanagement of public works had taken up hundreds of newspaper column inches. Earlier in 1876, Featherston cancelled a contract for another 4,000 immigrants from continental Europe that he had signed in May 1874 with Kirchner and Sloman. In 1874, in the middle of the immigration frenzy in New Zealand, Featherston had also decided to take over two Queensland contracts for 2,000 and 1,615 people. Kirchner then worked for the Queensland government. He agreed to resign and work for Featherston if he could use Sloman as his shipping agent. Featherston knew of Sloman, who had been involved with both the defunct Knorr contract and the stalled Queensland contract, but agreed to Kirchner’s choice of shipping agent. The Queensland contract had to be completed first. It was a month late and became Featherston’s excuse to wriggle out of the 4,000-immigrant deal. Kirchner and Sloman did not initially accept Featherston’s contrived reasoning and dispatched the first—and what would be the last—load of passengers they had already collected under the contract. The fritz reuter passengers disembarked on 9 August, still under the cloud of their lack of immigration status. Because of this, immigration officials were under no obligation to inspect the vessel, report on its condition, receive a surgeon-superintendent’s report, or ask for a copy of the captain’s log, which would have noted births and deaths. An unconfirmed 11 deaths included four children and six babies. Vogel, after leaving the premiership at the end of that August, became Featherston’s permanent replacement. Less publicly than Featherston, Kirchner and Sloman became equally persistent that they had followed their contracts in good faith. As the new Agent General, Vogel employed John Mackrell & Co. to sift through the documentary evidence. … it seems very much as if both the late Dr Featherston and our present Government had been indulging in a little sharp practice. … Foreign contracts for the supply of human beings are not supposed to be carried out in that precise way. The writer invites those fritz reuter passengers unable to find employment in “the North” to go to the Invercargill immigration barracks, where they would not remain long without offers of work. He or she reminded readers that England enjoyed highly profitable wool and silk manufacturing industries, thanks to accepting “imported foreign labour” from Belgium and France. Belgians fled to England during the massacres by its governor, the Duke of Alva, in the 1500s. A century later French Huguenots escaped to England with their silk-weaving secrets after King Louis XIV instituted a policy called Dragonnades to intimidate the Huguenots into converting to Catholicism. It is not clear why Featherston took over the two Queensland contracts for 3,615 immigrants while at the same time signing for another 4,000 with the same agent. The urgent appeals for labour in late 1873 and early 1874 suggest he may have wanted to secure his supply line. Yet in the draft proposal, Featherston had shrunk the time limit to 18 months. This put pressure on Kirchner’s and Sloman’s current immigration contract for New Zealand. In January and February 1876, the Agent-General received definitive instructions from his government: “Send no more foreign ships.”28 By then he had disengaged from Kirchner. This finally extracted a response from Featherston, and the first of his many letters repudiating liability for the fritz reuter passengers. Kirchner had a logical reason for asking Featherston for six months’ notice on the cancellation of the 4,000 contract: collecting immigrants and arranging ships would have taken time and it made sense that Kirchner and Sloman started to work on the 4,000 contract before completing the Queensland one. Potential emigrants from the German Empire had to get permission from its government, and Polish employees had to give three months’ notice to German employers. The emigrants had to sell property, collect the clothing and utensils required under New Zealand regulations and get themselves, often by foot, to Hamburg by a certain date. The fritz reuter Poles included those like the Fabish family, who had been conned out of their properties by a German neighbour, Wurtz. He told them that if they deposited their land deeds with him, they could continue to work the land instead of joining the Prussian army and fighting against their compatriots in the 1870–1871 Prussian-Franco War. After that war, Wurtz refused to return the Poles’ land deeds and drove them into progressively increasing poverty. Families such as Kowalewski, Krakowski, Lipinski, Roda, Rogacki and Wiśniewski had families already in New Zealand. Featherston’s pedantic and possibly revengeful nature came to the fore as he indignantly and authoritatively repeated his stance that the fritz reuter immigrants did not have official approval. He convinced enough government officials and newspapers to repeat his story. Vogel sent the message to New Zealand on 30 April 1877. Wellington’s Acting Immigration Officer included the fritz reuter passengers in his “Return of Immigrants” for the year ended June 1877.32 The ship appeared again in a general return of immigrants for the same year. It is not clear exactly how much the government paid Kirchner or Sloman but the passage alone cost the colony ₤5,792 10s. The fritz reuter Poles repaid those passages in a multitude of other ways. They might not have created a New Zealand wool or silk industry, but they knew how to farm and how to build. They came from the same area in Poland that had produced mathematician and astronomer Nicholaus Copernicus and from the country that on 3 May 1791 produced Europe’s first democratic constitution. THE ORIGIN OF THE PHOTOGRAPH OF THE FRITZ REUTER IS UNKNOWN. 7 - Appendices to the Journals of the House of Representatives (AJHR), 1871, D-3, PAPERS RELATING TO IMMIGRATION. 1–GENERAL REPORTS AND CORRESPONDENCE, page 37. 8 - For the purposes of immigration numbers in the 1870s, a statute adult was regarded as anyone older than 12. Children between one and 12 were counted as half a statute adult and babies younger than a year as “souls” who received free passage. 9 - AJHR, 1877, D2, page 57. 10 - Ibid, page 58. 11 - AJHR, 1877, D-5, NEW ZEALAND IMMIGRATION RETURNS, page 3. 12 - Any search of the AJHR or Papers Past with the word “foreign” comes up with hundreds of examples. 13 - Wanganui Herald, 13 March 1876, page 2, The Evening Herald, Monday, March 13, Papers Past, through the National Library of New Zealand. 14 - Ibid AJHR, 1877, D-5, pages 3 & 4. 15 - AJHR, 1877, D-2, IMMIGRATION TO NEW ZEALAND (LETTERS FROM THE AGENT GENERAL), page 60. 16 - Ibid, AJHR, 1877, D-2, pages 1 & 2. 17 - Ibid, Evening Post, 5 August 1876, page 2, column 3. 18 - New Zealand Herald, 8 August 1876, page 2, column 4, UNTITLED, Papers Past, through the National Library of New Zealand. 20 - AJHR, 1877, D-1, IMMIGRATION TO NEW ZEALAND (LETTERS TO THE AGENT GENERAL), page 5. 21 - Ibid, page 6. 22 - Ibid. AJHR 1877, D-1, page 4, no.7. 23 - Southland Times, 9 August 1876, page 2, WEDNESDAY 9TH AUGUST, 1876, Papers Past, through the National Library of New Zealand. 25 - Ibid, AJHR, 1877, D-2, page 58. 26 - Ibid, page 59. 27 - Ibid, pages 59 & 10. 28 - Ibid, page 10. 30 - Ibid, Southland Times. 31 - Ibid, AJHR, 1877, D-2, page 56. 32 - AJHR, 1877, D-6, NEW ZEALAND IMMIGRATION, (GENERAL REPORTS OF IMMIGRATION OFFICERS), page 5. 33 - Ibid, AJHR, 1877, D-5, page 2.